Multiple Sclerosis (MS) is a complex autoimmune disease, which is characterized by an interplay between inflammation of the central nervous system and neuro- degeneration, leading to the accumulation of disability and eventually to death (Compston and Coles 2008). The complexity of MS becomes already apparent in its pronounced heterogeneity, as both the symptoms including physical, mental and psychiatric problems and the clinical courses are highly diverse between patients. This high degree of disease heterogeneity urgently requires a personalized health care. Since the current treatment strategies for MS are based on population studies, the members of the Sys4MS project aim to develop new tools based on Systems Medicine to improve and personalize the therapy of MS patients. We are part of the Sys4MS consortium, which is composed of researchers from five European centers: (1) Institut d’Investigacions Biomèdiques August Pi i Sunyer (IDIBAPS) in Spain, (2) Uniklinik RWTH Aachen (UKA) in Germany, (3) IRCCS Azienda Ospedaliera Universitaria San Martino/ IST in Italy, (4) University of Oslo (UiO) in Norway and (5) Charité University Medicine Berlin in Germany. By taking advantage of the multidisciplinary expertise of its partners and benefiting from the results of the previous CombiMS project (http://www.combims.eu; Kotelnikova et al. 2015 and Bernardo­-Faura et al. manuscript in preparation) carried out by some members, the Sys4MS team plans to collect comprehensive data from a cohort of patients and utilize this information to develop mathematical models, which in turn can be used to generate predictive algorithms. These algorithms are expected to prognosticate the disease course and future disability in specific subgroups of MS patients and also to aid the selection of the best therapy for each individual. We at the RWTH Aachen University Hospital will contribute to the aims of the Sys4MS consortium by building logic models for individual patients and patient subgroups based on phosphoproteomics data that reflect signaling in immune cells, using the CellNOpt method (Terfve et al. 2012; www.cellnopt.org). 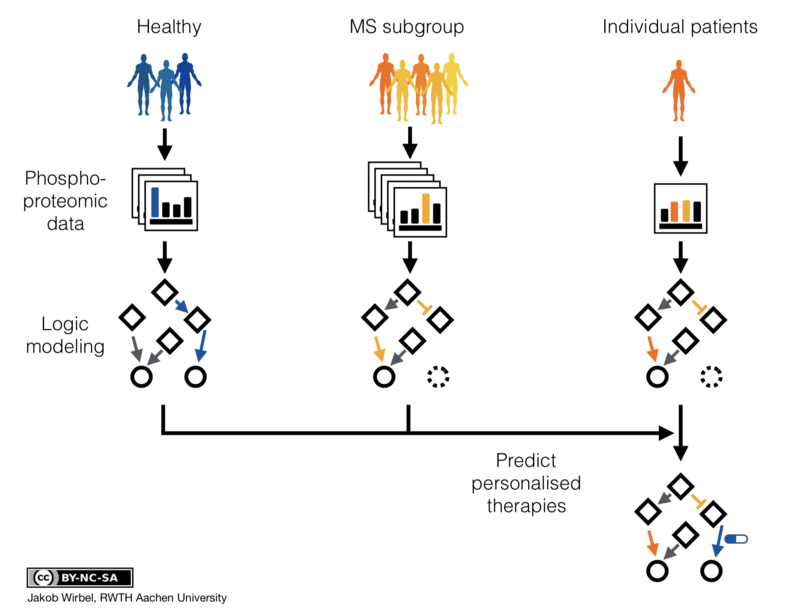 These models will then be analyzed to understand differences among subgroups of patients, identify biomarkers, and propose novel personalized therapies for MS.
Ekaterina Kotelnikova, Marti Bernardo-Faura et al. 2014. Signaling networks in MS: A systems-based approach to developing new pharmacological therapies. Multiple Sclerosis Journal, 2014: 138-146.